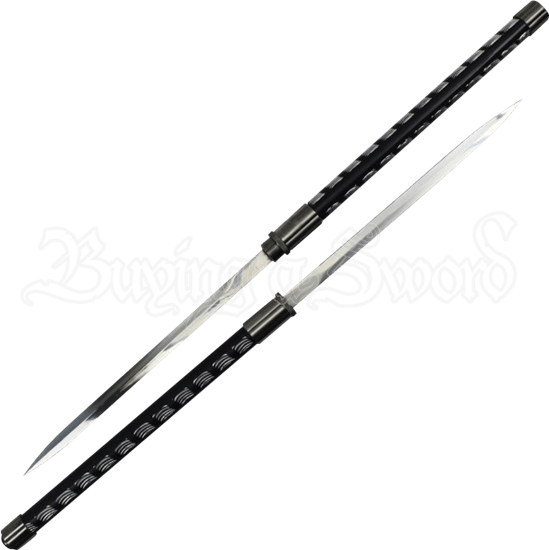 Surprisingly versatile, you are sure to startle and impress both friends and foes with the Interlocking Black Double Short Sword! These two daggers together interlock to form either a short combat staff or a double bladed spear. Made of stainless steel, the slender spear point blades feature a ridge all the way down their length. Each narrow hilt sports a black coloration decorated with silver lines, and a dark silver tone decorates the rounded guard and pommel. Slide the blade of one dagger into the other daggers hilt to form the staff, or join the pommels to create a double bladed pole weapon. Made to be displayed, these decorative martial arts knives are sure to amaze all you entertain when you showcase them within your sword collection.